Henry Cavill (Man of Steel) stars as Napoleon Solo opposite Armie Hammer (The Social Network) as Illya Kuryakin in director Guy Ritchie’s (Sherlock Holmes: Game of Shadows) action adventure film The Man from U.N.C.L.E. offers a fresh take on the hugely popular 1960s television series of the same name. Set against the backdrop of the early 1960s, at the height of the Cold War, the film centers on CIA agent Solo and KGB agent Kuryakin. Forced to put aside longstanding hostilities, the two team up on a joint mission to stop a mysterious international criminal organization that is bent on destabilizing the fragile balance of power through the proliferation of nuclear weapons and technology. The duo’s only lead is the daughter of a vanished German scientist, who is the key to infiltrating the criminal organization, and they must race against time to find him and prevent a worldwide catastrophe. The movie also stars Alicia Vikander (Ex Machina), Elizabeth Debicki (The Great Gatsby), Jared Harris (Sherlock Holmes: Game of Shadows), and Hugh Grant (Sense and Sensibility). Despite its acceptable rating from the critics (it garnered a 67% Fresh rating at Rotten Tomatoes based on 209 published reviews), U.N.C.L.E. didn’t rock it at the domestic box office, ringing up a relatively weak $45 million this past summer. The Blu-ray/DVD Combo Pack includes the film in high definition on Blu-ray disc, a DVD and a digital version of the movie in Digital HD with UltraViolet. 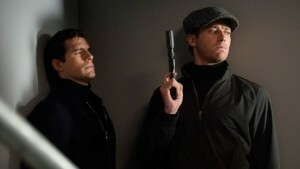 Buy or Rent The Man from U.N.C.L.E.